On May 17, 2000, Greyhound Pets of America – Minnesota (GPA-MN) began its involvement with the rescue of the Greyhounds illegally sold to Guidant. That was the date we first picked up dogs from a veterinarian in the St. Paul area, whose facility Guidant used to prepare the dogs for their surrender to adoption groups. From that date on, and over the next five months, we repeatedly received calls to pick up dogs. During this time, GPA-MN initiated no publicity locally because of the many animal rights activists in our area. The last thing that we wanted was publicity that might somehow interfere with the release of the dogs. Altogether, GPA-MN took possession of 81 Greyhounds from Guidant to either adopt out locally or prepare for movement to other groups. GPA-MN has no kennels, so each call created a scramble to locate enough foster homes for the hounds coming out. Sometimes it required putting together foster homes for as many as 14 dogs in 36 hours. We are grateful to our volunteers and to Maplewood Pet Care Center for their help in bringing the dogs out of the facility and providing them medical attention and a place to stay during the transition. The dogs came to us in good shape. Their spirits were high and they didn’t seem too much the worse for wear. Several of the dogs had no visible signs of their surgeries. However, most of them had shaved areas on their necks with incision sites about two inches long where the lead wire for pacemaker testing was removed. Some of them had their chests shaved as well, but we saw no signs of incisions in that area. We received medical papers and proof of vaccinations with each dog. We checked ear tattoos to make sure we were receiving the right dogs. Then we loaded them into vehicles to take them to Maplewood Pet Care Center where they were weighed, dewormed, cat tested, and given collars with identification tags. They also received a general check-up and any needed medical attention. After all the sorting and prepping, the dogs left with their foster people to begin a new life. Cappy’s shaved neck and incision site. Some dogs had unclear tattoos. When that happened, I got on the phone with the National Greyhound Association and hashed out the possibilities until we could positively identify the dogs in question. This was the case for Jamacamecrazy, a beautiful, spirited red brindle male. After working for quite some time to identify him, we weren’t allowed to have him — Guidant told us to return him to the lab. For some reason, Jamacamecrazy wasn’t to be included in that particular haul. To our great relief, he was included with the next batch of Greyhounds that we picked up. We did a lot of work to move the dogs on to other groups. USA Dog made more than one trip to pick up not only research dogs, but also a large number of dogs from the St. Croix Meadows track. They distributed the dogs to different groups across the country. During one of the USA Dog pickups, a CNN crew arrived to tape a story about dogs being sold to labs. 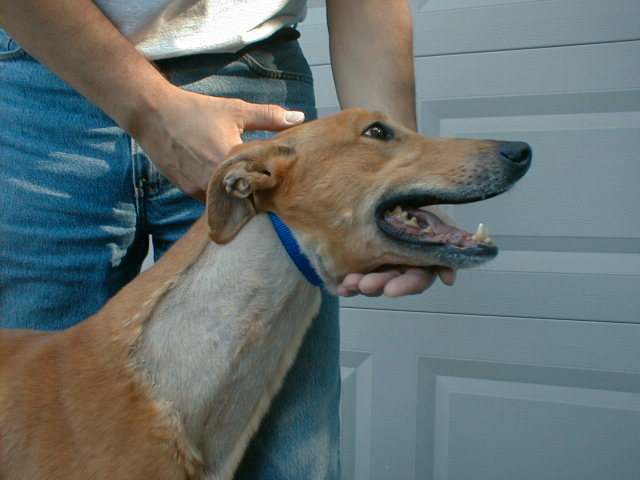 In addition to USA Dog, others were involved in picking up Greyhounds from the lab, namely REGAP-Rochester (Minn.), REGAP Twin Cities, and Cindy Evans. We transported a few to GPA-Wisconsin and even took a few dogs to the airport to be flown to a group in Philadelphia. It was definitely a team effort. The entire release operation took a lot longer than was originally expected. With the final release completed in October 2000, the process took a total of six months. Several of the dogs were adopted out through our group, allowing us to track them since their adoption. They are fine, healthy, well-adjusted dogs with no signs of health problems related to their surgeries. One such dog, a black male named Toby, was adopted by his foster parents Liz and Greg Hendricks. Toby’s racing name is Star Spangled. He has settled in quickly at home, although he’s still figuring out how to roo with his brother and sisters. He goes everywhere with his brother Tree and loves to chase him around the yard. Toby races up and down the stairs with his favorite toy. He’s a lovable and affectionate boy.